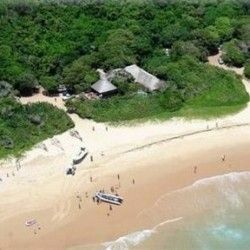 Mar Azul 26 is a wonderful privately owned self-catering villa in Ponta Malongane, Southern Mozambique - a short 2 minute walk from the warm, blue ocean. Mar Azul 26 (meaning Blue Sea) is a spacious villa, surrounded by indigenous shrubs and can accommodate a total of 12 people in 5 comfortable en-suite bedrooms. All bedrooms have sliding glass doors to the undercover deck which has a gas and weber braai as well as a sparkling private pool. Fully equipped for self-catering, the kitchen has 2 chest freezers, a fridge/freezer combo, coffee machine, microwave oven, ice machine and a 6 hob gas stove. The kitchen is open plan to the dining area, bar and TV lounge (guests required to bring own decoder and smart card for DSTV). The front rooms have beautiful ocean views, from the back end of the villa, there are scenic inland views over Lake Sugi – where spectacular sunsets can be viewed from the pool deck. 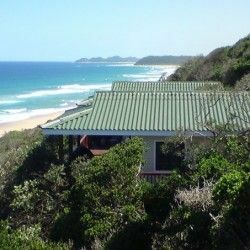 Guests are well looked after by the full time housekeeper and gardener who will help carry beach chairs, cooler bags and umbrellas down the wooden pathway to the beach below. I can confirm we enjoyed our stay and the staff in Unit 26 were particularly pleasant and helpful. The accommodation was very comfortable and well laid out, although some of our party did struggle with the stairs. If I have one criticism it would be that we were disappointed with the overgrown foliage that obstructed sea views particularly the dining area of 26 which we used as our communal eating area. I must also mention that the small deep freeze in the bar area of unit 26 is not really working. All in all we enjoyed our stay once again, and thank you for all your help and assistance in making this booking go so smoothly. We had a super stay and enjoyed every minute. Friendliness: Luigi and Nelly was SUPER friendly and helpful. We enjoyed their service a lot. Facilities: Loved the facilities, could not be better - more than we expected. Overall: The geyser to share for two rooms burst and was not working - it really didn't bother us. There was plenty more space to shower with hot water. Luigi immediately assisted us and apologised. The shower in the one room does not drain properly and Luigi kept asking us during our time if all was well and checked in on it - very hands on. It would've been great if the fridge worked. We used the bar deep freeze as a fridge to cool our drinks and food. What a lovely place and a comfortable stay - we will definitely return again.